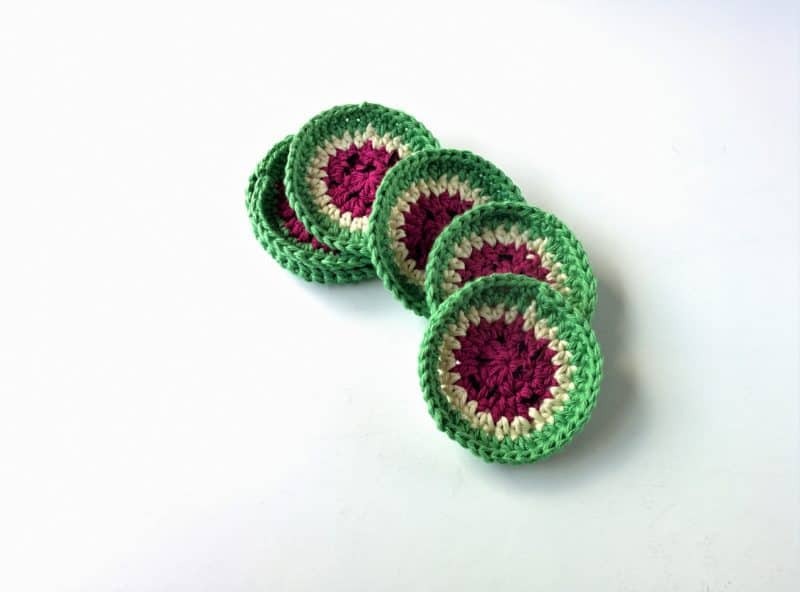 I love coasters, and these crochet coasters are a combination of some of my favorite things. The other day, my actual cork coaster just crumbled and since I couldn’t stand the thought of putting a drink onto my desk with a coaster underneath it, I whipped up these cute little slices with some cotton yarn. 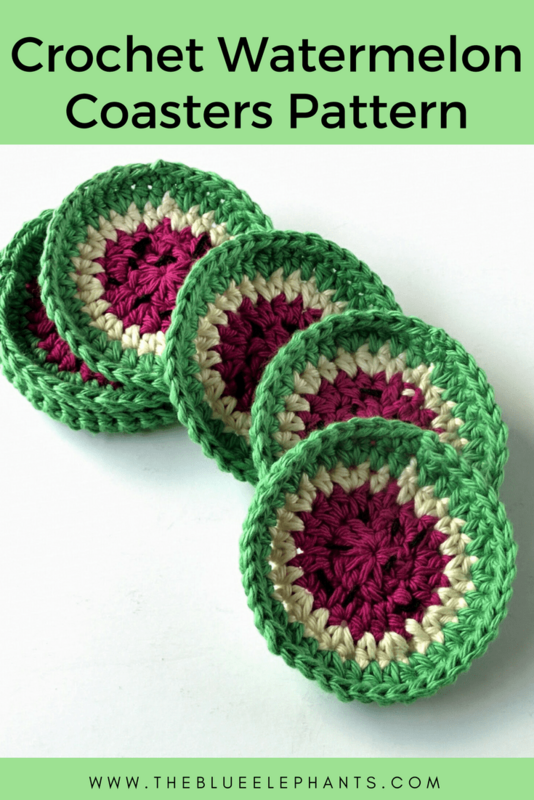 These crochet coasters are super easy to make and perfect for beginners. In fact, they’re part of a special crochet for beginners freebie that I’ll tell you more about below. 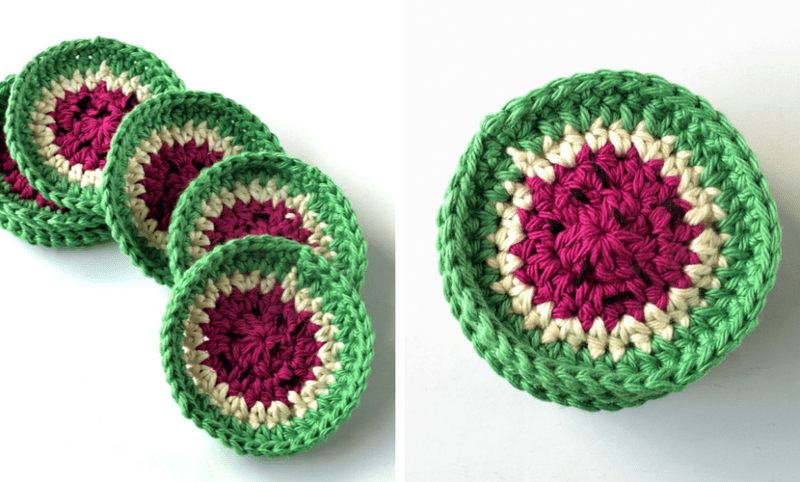 Now, let’s make some crochet coasters perfect for summer! 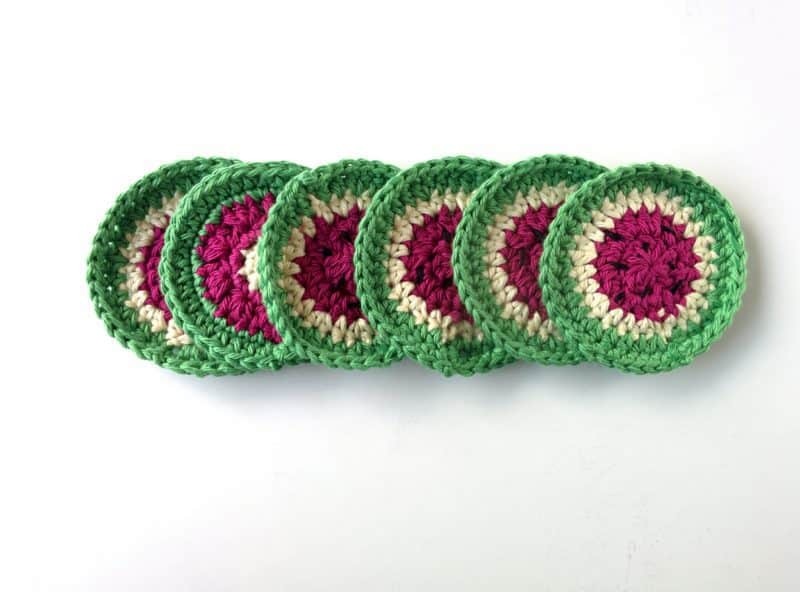 I’ve been using my crochet coasters so much lately and they are way better than regular coasters. Because these are made of cotton, they’re super absorbent and will soak up the condensation that drips down the side of a glass. Unlike regular coasters that end up with a little puddle on them. Also, if I do have a spill, I can use the coaster to wipe it up and then just throw it in the wash. So easy! 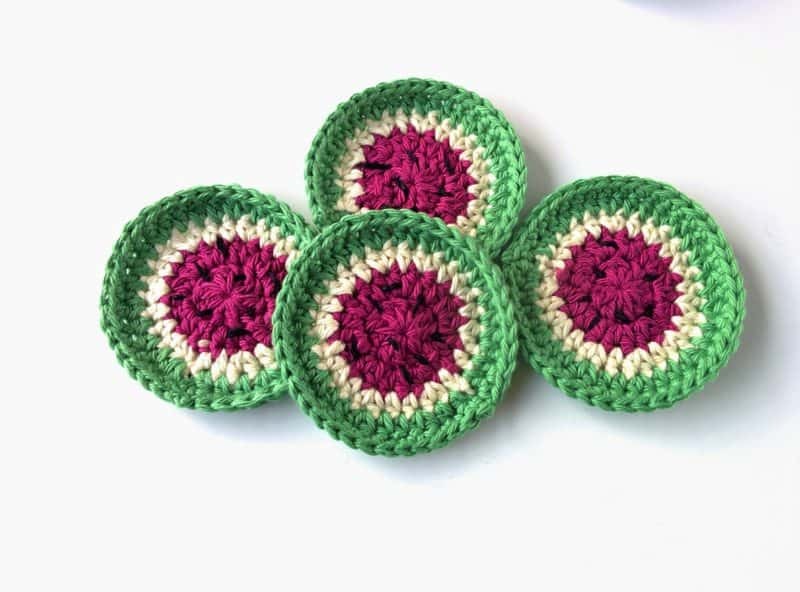 And best of all, these crochet coasters are so much cuter than any I’ve seen in stores and I can make them in any pattern I choose, even watermelon slices. This pattern is actually one of the patterns in my ebook, The Beginner’s Guide to Crochet. 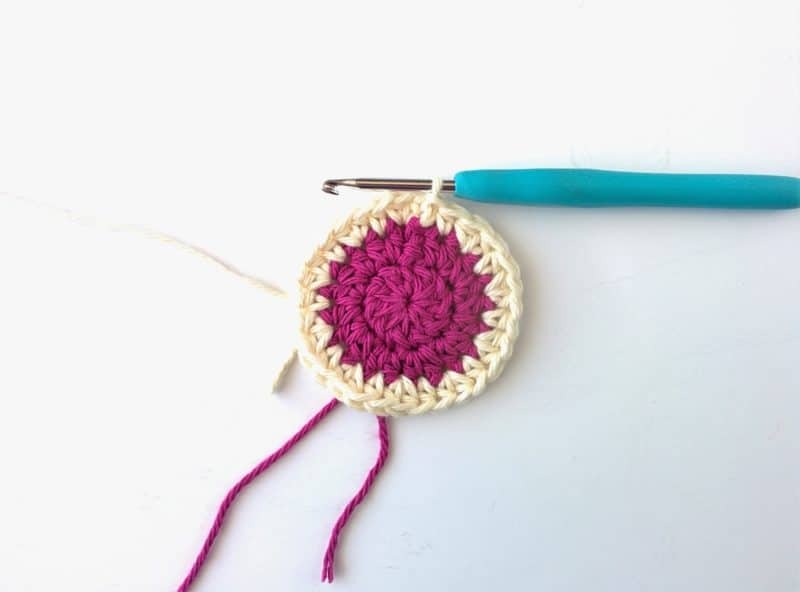 Basically, it’s your go-to resource to learn crochet and practice essential skills with some easy patterns, like these crochet coasters. 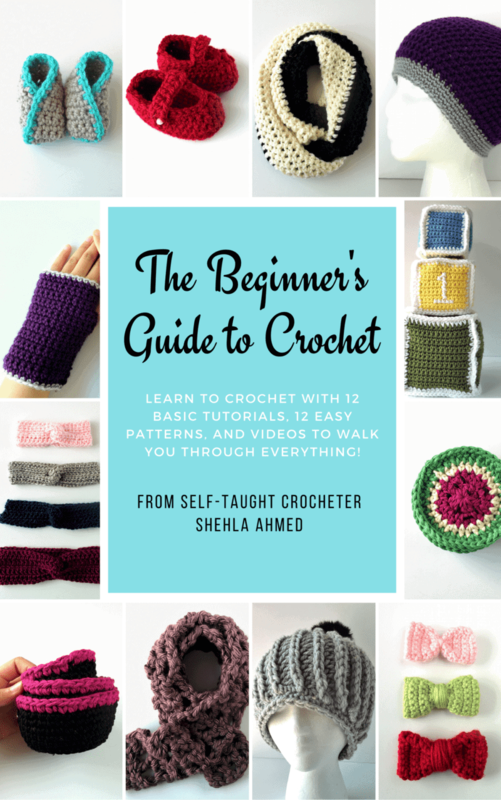 The book has a total of 12 beginner-friendly patterns to practice with, along with 12 tutorials and tips to help you learn stitches and techniques. Each pattern also has a full video tutorial so you can follow with me! 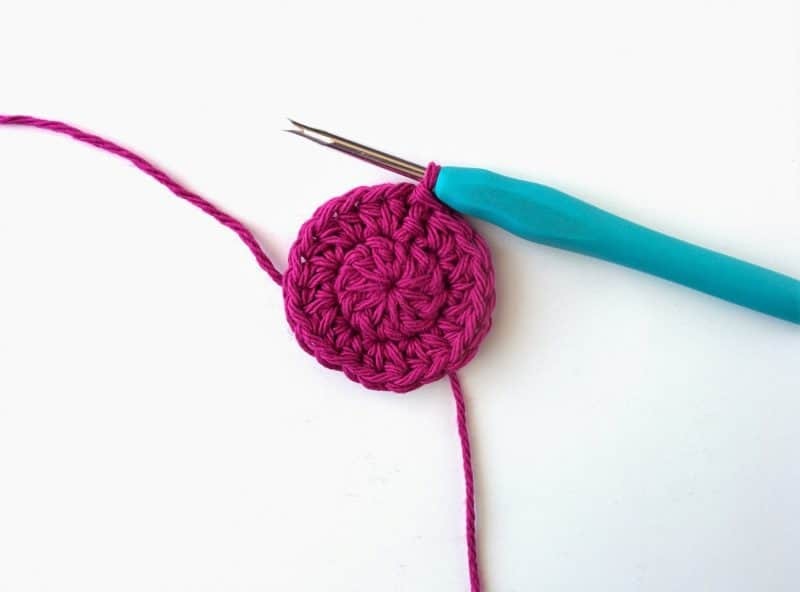 You can grab your free copy of The Beginner’s Guide to Crochet here. And just like in the book, there’s a video to go along with it! 1. 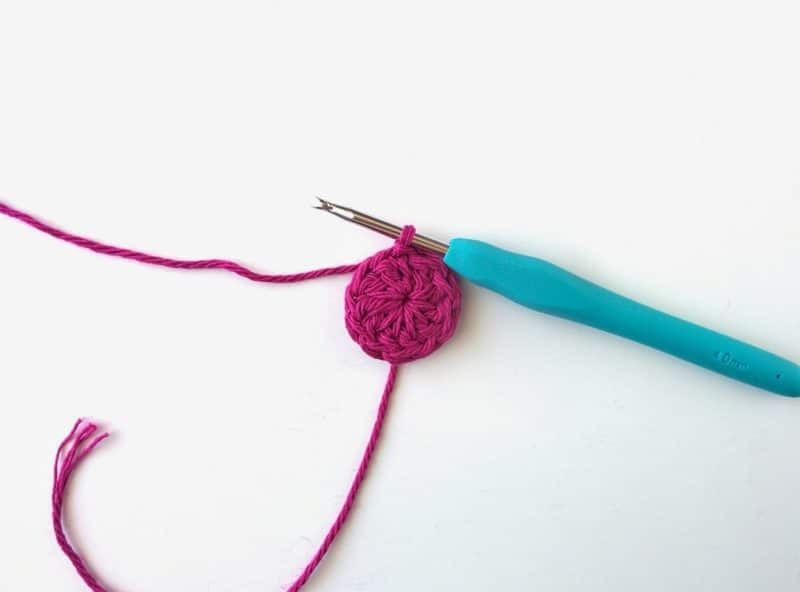 Start by creating a magic loop using the pink yarn. Chain 1, then work 10 DC into the magic loop. Slip stitch to the chain space to finish the round. You should have 10 stitches now. 2. Chain 2. Work 2 DC into each space, including the same space as the chain 2. At the end of the round, slip stitch to finish. You should have 20 stitches. 3. Switch to white yarn, and chain 1. Work 2 HDC into the same space. *HDC in the next space, and work 2 HDC into the space after that*. Repeat everything from * to * all the way around. Slip stitch to finish the round (30 sts). 4. Switch to green yarn, and chain 1. Work 2 HDC into the first space. *HDC into the next 2 spaces, then 2 HDC into the third*. Repeat from * to * around. Sl st to finish the round (40). 5. SC all the way around. BO and weave in the loose ends with a tapestry needle. Optional: If you want to add seeds, use black yarn/embroidery floss and a tapestry needle to add little lines to the pink section. And you’re done! How cute are these little watermelon slices? I had these laying out while I was taking pictures and my sister loved them so she has a few of them too. Now I never have to remind her to use coasters! I had so much fun making these, I’m going to try other designs soon. Maybe oranges or a kiwi? Thanks so much for reading! 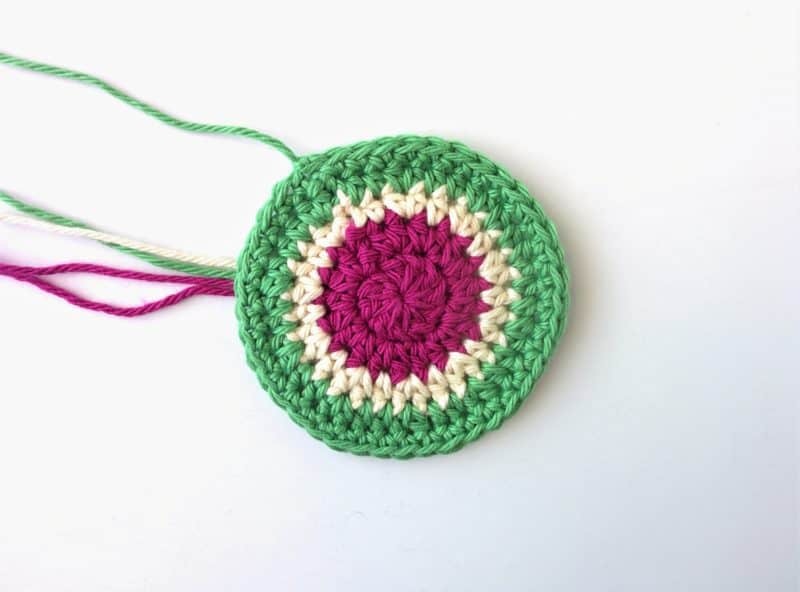 I hope you had fun with this quick and easy little pattern for crochet coasters. If you haven’t already, subscribe to the email newsletter down below and you’ll get free patterns sent to your inbox every week along with freebies and access to the resource library. That’s all for today, but be sure to look around and I’m sure you’ll find something you love! 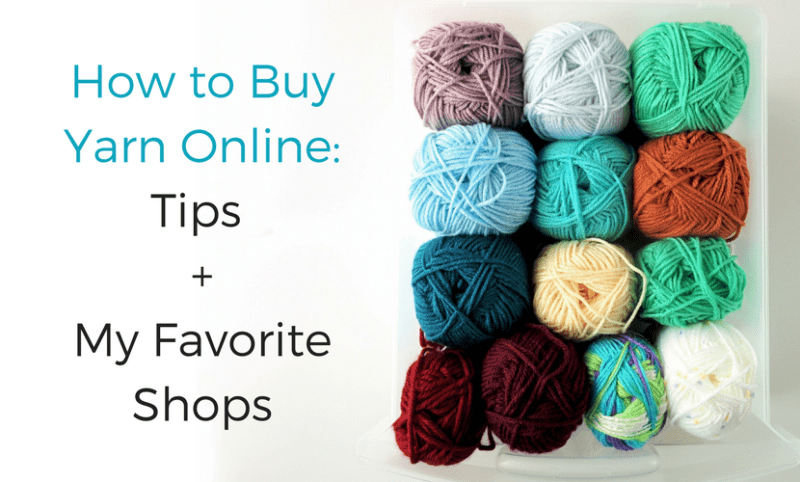 Related: How to Buy Yarn Online + My Favorite Shops! 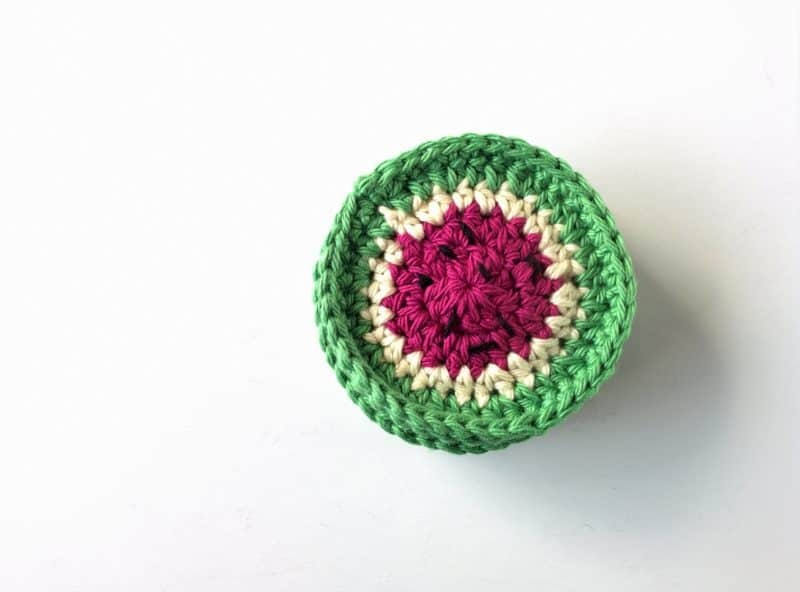 Your watermelon crochet coasters are so fun! What a great look for summertime. Thanks for sharing your talents with us at Snickerdoodle. I’ll be featuring this at today’s party. Thank you, Beverly! I’m so glad you like them, they were fun to make!